That said, “Emperor” nevertheless proves, by its end, to be strangely moving, thanks to the interplay of master actor Tommy Lee Jones as “Makasa” himself and a judicious portrayal of the then-tennō heika, courtesy of Japanese actor Takataro Kataoka. “Emperor” is the 98-minute-long dramatized, time-compressed rendition of how MacArthur tapped another real-life individual named Brig. Gen. Bonner Fellers — played by TV star Matthew Fox (“Lost”) — to determine if there was any evidence that Japan’s emperor should either be exonerated — or tried as a war criminal and hanged by the neck until dead for complicity in the decision to attack Pearl Harbor, not to mention all the things Imperial Japan did before WWII in Manchuria, Korea, the Philippines, Singapore and so on. But in defense of that contrivance, Foster said, “The role of a documentary is to get the facts right. What you strive for in a film is to try to get to the truth.” Point well taken. 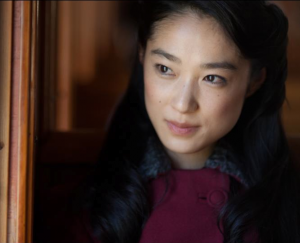 But the other Hollywood contrivance imposed is that of a love story between Fellers and a Japanese woman (played by Eriko Hatsune, conveying ethereal Japanese femininity) with whom he fell in love prewar. Unfortunately, she and the love affair are completely made up, although the fictional romance did allow certain plot points to advance. Even their meet-cute on a college campus is so implausibly fast that if you blinked, you’d wonder how it happened. Peter Webber’s direction is solid, though unspectacular. The re-creation of the incinerated remains of Tōkyō is, overall, effective. The Japanese acting talent is uniformly fine, probably “Emperor’s” strongest point. That makes total sense since producer Narahashi’s reputation before this was as one of Hollywood’s go-to sources for Japanese acting talent for such movies as “The Last Samurai” and “Memoirs of a Geisha.” I sincerely hope that she and Nomura use the wisdom and experience gained in making “Emperor” as a springboard to bring more such stories to the screen, getting better with each effort. The contrivances of the script, however, weaken the overall story. Is not the search for possible culpability of Japan’s emperor in the martial expansion of Japan’s empire enough to propel the movie without an ersatz love story that never took place? Didn’t we learn about the trouble caused by fake girlfriends from Manti Te’o, for goodness sake? Hollywood’s conventional wisdom, however, demands a love story to draw female patrons, even if it’s made up. Understood. 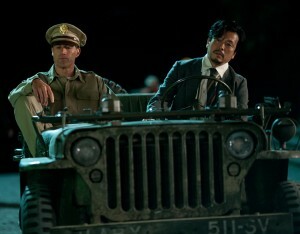 Matthew Fox as Gen. Bonner Fellers and Masayoshi Haneda as his interpreter, Takahashi. But elsewhere, while the flashbacks to Fellers and girlfriend in years gone by fill out details, they also interrupt the story’s flow. Regarding Fox, he’s good but not great. (I could say he looked a bit “lost” — but that would be mean.) As Fellers, he is supposedly to be an expert on Japan, yet his ability to speak and understand the language seemed ambiguous. To wit, he utters a few Japanese phrases, but Fox’s hatsuon (pronunciation) is unconvincing. In a confrontation scene between U.S. soldiers and the Imperial Guard, actually shot on the grounds outside the Imperial Palace in Tōkyō, trusty translator Takahashi (Masayoshi Haneda), trying to protect his boss, uses teinei na kotoba (polite speech) instead of direct demands to meet with one of the emperor’s advisers, Teizaburo Sekiya (Isao Natsuyagi). But then we are led to believe that Fellers understood everything that was said between the guard and Takahashi and that he knew Takahashi was dissembling. So why have a translator at all? Then there are several scenes in which Fellers, by himself, frequents a local noodle house in the ruins, much to the chagrin of some locals not too pleased to see a Yankee in their hangout. In one of those instances, a fight breaks out and Fellers — a brigadier general, mind you — gets a nice home-style beat-down from some local riffraff. It seems implausible, but did it really happen? Who knows? When you mix stuff that happened with stuff that might have happened with stuff that didn’t happen, it just makes you wonder what was real and what was made up. The problem grows because of the climactic battle between palace guards and the militarists upset with the emperor’s decision to surrender via a recorded speech, which apparently did happen and is shown. Casual viewers might be confused as to whether this battle really happened or if it was more dramatic license. All that aside, “Emperor” is still worth seeing. After all, how many movies besides this one can you think of that seriously examines this crucial period of time, when history was in flux and seemingly small decisions could be as potentially impactful as the large ones? I have to applaud the filmmakers’ attempt to tell this otherwise untold story. Though it has flaws, it has its strengths, too, and its sincerity goes a long way. 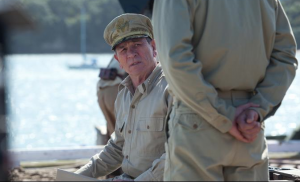 Tommy Lee Jones as Gen. Douglas MacArthur. SIDEBAR: WHERE ARE THE NISEI? It’s probable that Japanese American audiences might be a bit miffed about “Emperor’s” dearth of depictions of any Nisei among the U.S. Forces during the Occupation. I discussed the issue with Oscar-winner Chris Tashima (“Visas & Virtue”), who attended a Sunday preview screening of “Emperor” in Little Tokyo. During the Q&A that followed, he took issue with the panelists over the absence of Nisei being shown. “They said that in their research, they didn’t show up,” said Tashima. “I called them out on that.” He added that some folks in the audience were annoyed with him picking on the guests, though. He said that fellow audience member Darrell Kunitomi framed the issue “a little more rationally” — and he noted that his uncle, Jack Kunitomi, who is nearly 100, was MIS and worked in the building next to where Gen. MacArthur was headquartered. Tashima said he simply wanted to point out that it was an oversight. In our chat, I noted that the Takahashi character, who served as Gen. Feller’s translator, is a Japanese national; but what if he had been a Nisei or Kibei who had his own personal journey to find missing relatives or loved ones? That would have solved that missing Nisei problem and even added some layers to the story. Tashima said that as they were wrapping up the Q&A, one of the producers said they appreciated the dialogue and said that maybe in the DVD, they could include a feature on the MIS. That made me think that perhaps they should talk with Japanese director Junichi Suzuki, who recently directed “MIS: Human Secret Weapon.” That would be a beautiful solution.